Day 1: We all have to shop! Why not save money while doing it? Day 2: The Language of Couponers – Translated! Day 3: Where Art Thou Coupons? With all of your coupon knowledge, you can now begin your stockpile. The longer you coupon, you know the deals always come around again. I used to think that free toothpaste would never come around again but now I know that there is always free toothpaste available so I don’t stress if I can’t get to the store on that particular week. By stockpiling items before you need them at the lowest price, you won’t have to buy at a higher price when you have to have them. This also eliminates unnecessary trips to the store, which could cause you to make impulse purchases. 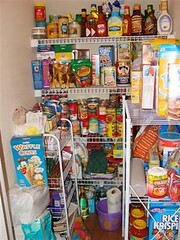 Another advantage of stockpiling is you already have food stocked in your pantry, thus giving you no excuse not to cook. It is recommended you come up with a list of your 50 or so most used products. Items you can have on hand to whip together a meal anytime. This will be different for every family. Some of our family’s stock up items include cleaning supplies, laundry detergent, Crest Pro Health Toothpaste (yes, someone is picky! 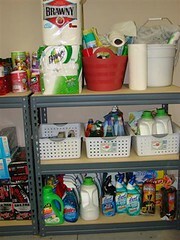 ), personal care products, canned soups, cereals, bread, etc. To get the most out of couponing, you usually have to expand your horizons and not be brand specific. If you are brand specific, like in our household have to buy Crest Pro Health Toothpaste in spearmint only or Gillette disposable razors, or only Aloe Shaving Cream, or only Tyson breaded chicken products (Have you guessed who the picky person is yet?) you may have to wait longer for a sale to come along. When it does, you will want to make sure you have several coupons on hand so you can buy enough to last your family until the next sale comes along. So when do you stockpile? Some people track the lowest prices with a spreadsheet or something called a price book. Mine is stored in my head but here’s a few items and the my target rock bottom price. Remember this will differ for everyone and will differ on your own family’s needs. Bargain Tip: For perishable items like potatoes, make a huge batch of home made mashed potatoes and freeze into smaller containers to re-heat later. The professionals say the sale usually cycle through every 12 weeks. Some cycle through more often. Others cycle through less. You get more of a feel for this the longer you coupon. I try to give you the best coupon match ups here but only you can decide if a item is “worth” the price for you to stockpile. You will notice that usually around 4-6 weeks before a holiday or season change, the related items will start going on sale. Baking items start going on sale at the beginning of November, Halloween candy starts going on sale at the beginning of October, etc. so you will stock up on those items before you need them. Some things like lipbalm are considered “necessities” and I will ANY price for these items. Even though, I try to stock up when I find it for around 30¢/tube but sometimes you have to pay full price if is a “need” item. You can save money by having the items you use regularly on hand because 1) you purchased at a low price and 2) saves time, money, and impulse items when you have to stop at the store for that one item 3) ingredients on hand to make meals instead of reaching for the phone for take out. 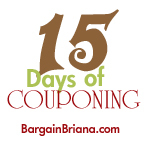 The 15 Days of Couponing will guide you through the art of couponing. It is a skill that you can learn and maximize to the full potential to help your family and help others. So if you are interested in cutting your grocery budget in half or more, read yesterday’s edition and stay tuned for tommorrow’s edition. Am 71 year old male couponer on a fixed income. Since the early fifties mom drilled it into us six kids the following method of really stretching a buck: Item has to be on sale, and have a coupon to match, otherwise NO SALE. In short I love this site as well as the postings from fellow reader. Keep up the great work. ilove couponing, saved a bunch over the years!! I guess i was meant to coupon. I’m a picky eater, but not picky about brands; because we had little when i was under my parents roof, so you take what you can get. Yay for me! Looks like we might find good deals. Cure for picky DH = just refill the container with something different. My hubby is helmanns mayo kind of guy .. did you know that helmanns mayo is in a shop rite jar .. yes it is folks … shop rite and all the other stores don’t make food so you will find that private label is a lot of times the actual maufact. of the product. I refill all his products. He swore by Head & Shoulders until I showed him one day he was using Shop rites version for over a year. I am enjoying the series a great deal. I am new to couponing, and have had some major success at Walgreens, and CVS, 70 – 90 % savings! I am still only saving about 40 to 50 % at the grocery store, but I guess you can’t work miracles overnight. And I must say, I am quite fortunate not to have a picky husband or kids for that matter. Thanks so much again for the great series! Somethings youcannot change and that is a picky husband on brand things mine isn’t real picky but on very few things sure as Bologna and Hotdogs(Eckrich is our brand)has been for over 40 years. Come and pick up your Sisterhood Award. BTW, I am really enjoying this series!! I totally hear you on the Picky DH who is brand specific. Kraft Singles, Kraft Mac and Cheese, Tide, Bounce, Crest Paste not Gel, Old Spice Body Wash, Pantene 2 in 1 (he shaves his head… I still don’t understand the need for a shampoo.. conditioner-yes, shampoo-no), Right Guard Xtreme Fresh Blast, Cottenelle Buttwipes, Kleenex brand tissues, Schick Quattro Razor Blades (no disposables), Angel Soft tissue, Bounty Paper Towels, Coke, Ice Mountain bottled water. I stock up when I can. I use the coupons if I have them, but find that with our limited storage space, that we still run out before the next good sale. We are currently on our last bottle of Tide and I just had to buy Old Spice Body Wash yesterday at full price minus $1.00 coupon. I have tried sneaking other brands in, but he notices and calls me out every-time. I find myself jealous of everyone who doesn’t have a brand specific hubby. I have my favorites, but I will use what’s available. He hasn’t budged in over five years, so I am grateful for the freezer full of food he will eat and the other household items he doesn’t care about. And I keep telling myself one day that we will have a house with a proper garage with shelving so I can do a real stockpile. Do you have any more tips on dealing with a brand specific hubby?